Ideal for transporting kit and muddy boots! The Fade Shoe Bag is a new design zip-up shoe bag. 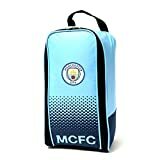 The Shoe Bag is in club colours and features club crest on the fade design background. The Fade Shoe Bag is great as a gift and ideal for storing your football boots. It measures approximately 16x10x36cm and is made of 100% Polyester. This shoe bag is an official licensed product. This entry was posted in Man City and tagged Boot, City, Football, Handle, Manchester, Shoe, Team by Footy Star. Bookmark the permalink.